The new Doctor Who has a new look. As portrayed by Jodie Whittaker, the first woman to take on the vaunted role, the 13th incarnation of the time-and-space-tripping Gallifreyan is all dressed up with everywhere to go. 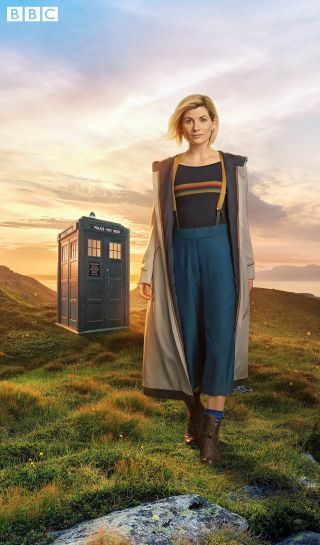 In a new photo from the BBC, the "Broadchurch" star flaunts shin-skimming, high-waisted teal culottes, mustard suspenders à la the Second and Eleventh Doctors, burnished combat boots, and cobalt-and-white socks. A deep navy shirt with a ballet neckline is embellished at the bust line with mustard, orange and teal stripes — a little Wesley Crusher–adjacent but more likely a reference to the Fifth Doctor's iconic scarf. The look has a quirky, gamine quality — neither aggressively masculine or feminine but a finely toed point in between. The Doctor's costume has always informed his — and now her — personality; the austerity of this one telegraphs a businesslike sobriety but its embellishments lend it a decidedly puckish air. Is there a hoodie hidden behind her? Are the pockets bigger on the inside? Will Whittaker's Time Lady have a yen for jelly babies, Jammy Dodgers or funny hats? We won't be able to tell until next fall, when the Thirteenth Doctor, fresh from her regeneration from Peter Capaldi's Twelfth this Christmas, makes her official, full-length debut. Three new regular cast members will join Jodie Whittaker (center) on the next season of "Doctor Who." From left to right: Mandip Gill, Bradley Walsh, and Tosin Cole. The upcoming 11th season will comprise nine episodes with a 50-minute runtime and a special 1-hour premiere, according to the BBC. Whittaker will be accompanied by series regulars Bradley Walsh as Graham, Tosin Cole as Ryan and Mandip Gill as Yasmin. Sharon D. Clarke will appear in a recurring role.